NASA ordered astronauts aboard the spaceshuttle Discovery to skip their first landing attempt Monday because of rainand low clouds at their Florida landing site, leaving the shuttle one morechance to try to return to Earth today. Discovery'screw of seven astronauts is returning to Earth after resupplying theInternational Space Station with tons of fresh supplies and new scienceequipment. NASA hoped to land the shuttle at the Kennedy Space Center inFlorida at 8:48 a.m. EDT (1248 GMT), but thick clouds obscured the runway and rainshowers were creeping too close to allow Discovery's return. "We're going to wave off for the first opportunitytoday," Mission Control radioed the shuttle astronauts. The shuttle is now targeted to land inFlorida at 10:23 a.m. EDT (1423 GMT), though only if Mother Nature gives Discovery'sastronauts a break in the weather. "Thanks a lot, we know you guys are working it hard,we look forward to maybe an improved weather picture in about an hour and ahalf," Discovery commander Alan Poindexter told Mission Control. NASA flight rules forbid space shuttles fromlanding in the rain because it can damage their fragile heat shield tiles,among other risks. Low cloud ceilings, like the one that thwarted today's firstlanding attempt, are also a problem because they affect runway visibility forshuttle commanders and pilots. The shuttle will re-enter the atmosphere overthe northern Pacific Ocean, then fly to the south of Seattle, Wash., and overRock Springs, Wyoming, northeast of Denver, Colo., Tulsa, Okla., Little Rock,Ark., southeast of Montgomery, Ala., and south of Tallahassee, Fla., beforelanding at the Kennedy Space Center. Weather conditions in Florida are expected toimprove slightly on Tuesday, when NASA will have two different landing sites tochoose from. In addition to the primary shuttle landing site in Florida, thespace agency will activate a backup runway at Edwards Air Force Base inCalifornia. The weather in California is also expected tobe relatively clear. But NASA prefers to land Discovery in Florida ? theshuttle fleet's home port and launch site ? 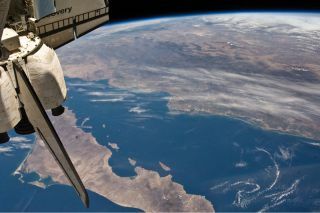 since it saves about a week of timeand $1.8 million in transport costs to ferry the spacecraft home fromCalifornia atop a modified Boeing 747 jumbo jet. Discovery has enough supplies to remain inspace until Wednesday, but NASA wants to land the shuttle by Tuesday in orderto keep one day in reserve in case of an unexpected malfunction. Discoverylaunched into space on April 5 on what has become a 14-day mission todeliver new science experiment equipment, supplies and big spare parts to theInternational Space Station. The astronauts performed three tough spacewalks toreplace an ammonia coolant tank outside the station. A stuck valve inside the new tank has kept itfrom working properly, but Mission Control opted to have station astronauts fixit later on future spacewalk. This mission is one of NASA's last fewshuttle flights before the space plane fleet is retired in September. It is thesecond-to-last mission for Discovery, which is NASA's oldest space shuttle. After this flight, only three more shuttlemissions remain. ?